Roar - bring a dinosaur into your home this Christmas! These dino-tastic dinosaur construction kits are a perfect gift for both kids and adults. Snap out the wooden pieces and race against the clock to assemble a T Rex. 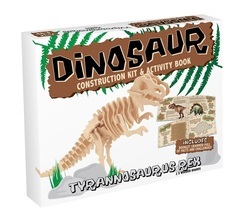 Can you beat the estimated build time to construct your very own Tyrannosaurus Rex? These beautifully crafted wood dinosaur construction kits are great fun and value… especially with the NEW fun filled fact booklet! There are 5 terrifying dinosaurs in the range to collect. Why not try out some of the other dinosaurs in the range, and start your very own Jurassic Park! These cool kits have proved highly popular with both children and adults alike. These fantastic wooden models are made from pre-cut plywood sheets that come ready to assemble. Each model is built by slotting the individual pieces together, following the easy to use numbering system included in each kit.